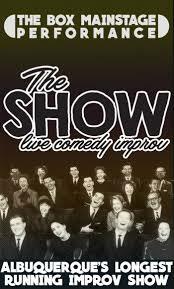 The Show is the longest running comedy improv show in Albuquerque, having performed for over five years and still going strong! The beauty of improvisation is that every performance is created without preparation and completely different. The content depends on the audience and the suggestions they provide. Audiences will never see the same show. Using audience suggestions and any absurd ideas that cross their minds, improvisors create scenarios and songs that are hilarious and preposterous, letting the audience in on the jokes. The Show has won many local awards, including Best Comedy Troupe by Albuquerque the Magazine’s Best of City and the Weekly Alibi’s Best of Burque, as well as Top 5 Comedy Shows in the Weekly Alibi’s Best of Burque. The Show has had the privilege of performing several times with many veteran improvisors who are members of the cast of AMC’s Better Call Saul, including Bob Odenkirk, Micheal Mando, Rhea Seehorn, Josh Fadem, and Patrick Fabian.